The FBI wants your help in solving one of the biggest challenges in current cryptography. Back in 1999, the body of a murdered man named Ricky McCormick was found near St. Louis, Missouri. McCormick's killer has never been identified, but the FBI believes the key to finding him may lie in two coded messages found in the victim's pocket. The FBI thinks McCormick himself wrote the notes...family members say he wrote coded messages ever since he was a little boy...but no family member knows how to read them. 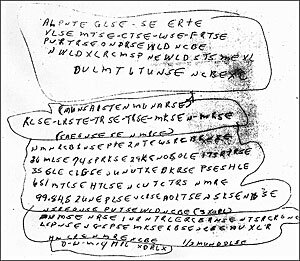 Since the murder, FBI code experts have tried and failed to figure out what the notes say, as have amateur cryptography fans. Want to give it a shot? The FBI has the full details.